EcoPure's reverse osmosis system is the superior option to bottled water, delivering healthy drinking water right to your kitchen sink or refrigerator. This 3-stage system saves you time and money on replacement filters, because when it comes to bottled-quality water, three stages are all you need. The encapsulated filter design feature means filter changes are quick and mess-free. No tools. No need to shut off water supply. No touching dirty filters. Enjoy unlimited access to safe, top-quality drinking water right from your kitchen sink or refrigerator. Lifetime Warranty Available. Validate your lifetime warranty by registering your product on EcoPure's website and uploading replacement filter purchase reciepts twice a year. The slim and elegant H2O+ Pearl Countertop Water Filtration System offers performance typically found only in under-counter systems, but without the hassle of complex installation. In less than 10 minutes you have continuous, refreshing filtered water on command. The system utilizes a patented carbon block filter with advanced inner core, dramatically reducing industrial chemicals, pesticides, herbicides, turbidity, volatile organic compounds (VOCs), and bad tastes and odours. Reduce harmful chemicals like atrazine, chlorobenzene, trihalomethanes, methoxychlor, endrin, 2,4-D, benzine, DBCP and aesthetic chlorine from your tap water for a healthier home and family. The slender unit installs effortlessly with the provided faucet diverter and fits 99% of standard home faucets (note: not compatible with integrated pull-out or pull-down sprayer type faucets). EcoPure's High-Flow Whole Home Filtration System is designed for larger homes with 1-inch plumbing and installs right on your incoming water line to protect your home's water-using appliances and plumbing. 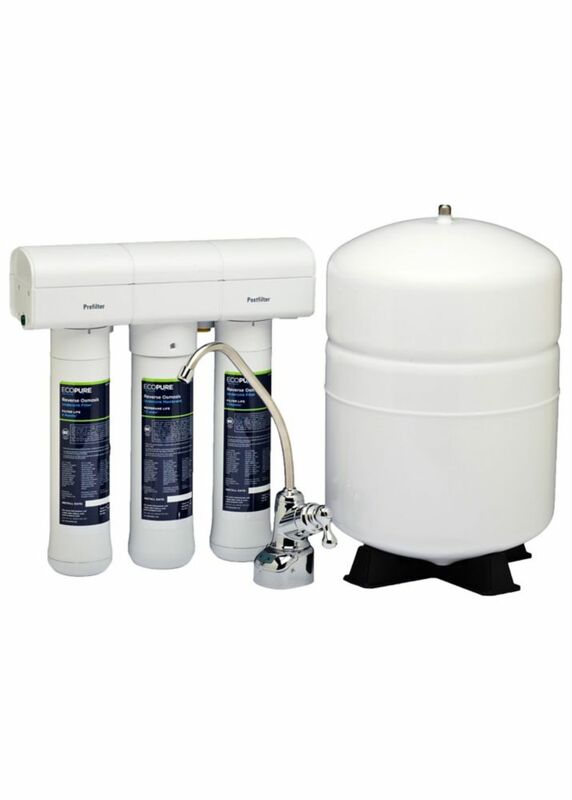 This open sump system is compatible with EcoPure large capacity, whole home filters EPW4F, EPW4C, EPW4P and all other major brands of large capacity, drop-in-style filters. Once you've selected the perfect filter, regularly replacing them is effortless, thanks to this system's mounting bracket and pressure release button. The ISPRING 5-stage 100 GPD RCC1P RO system incorporates polypropylene sediment (PP), granular activated carbon (GAC), carbon block (CTO), and Reverse Osmosis technologies to provide crisp-tasting, bottled-quality water straight from your tap year after year. The RCC1P comes with a Booster Pump pre-installed to bring low incoming water pressure up to the optimal level for the reverse osmosis process. The installation is streamlined and DIY for most users, with written, video, and tech support assistance if needed. Replacement filters are standard sized and available at factory direct pricing. Based on our best seller model #RCC7, featuring 100 GPD reverse Osmosis membrane, 11-Watt UV Sterilization Lamp with Smart Flow Sensor and 24-Volt Boost Pump, this is a comprehensive Reverse Osmosis water filter system. Most UV sanitizers in the market have the lamp powered on constantly; we have developed the innovative transformer that features an inline Flow Sensor. Whenever you turn on the drinking faucet and water starts flowing, the UV lamp is powered on automatically and turns on and off along with water flow. This prevents a potential heat hazard and extends the life of the UV light bulb dramatically. ISPRING RCC1UP generates purified water for drinking, cooking, hydroponics, aquariums and wherever ultra-pure water is needed. The unit removes hardness, heavy metals, toxins, bacteria, viruses, and many other tap water impurities. The equipped 11-Watt UV Sterilization Lamp makes this model more suitable for potential highly contaminated water source such as well or groundwater. Reverse Osmosis Undersink Filtration System EcoPure's reverse osmosis system is the superior option to bottled water, delivering healthy drinking water right to your kitchen sink or refrigerator. This 3-stage system saves you time and money on replacement filters, because when it comes to bottled-quality water, three stages are all you need. The encapsulated filter design feature means filter changes are quick and mess-free. No tools. No need to shut off water supply. No touching dirty filters. Reverse Osmosis Undersink Filtration System is rated 4.0 out of 5 by 58. Rated 5 out of 5 by SunnyNM from I got this to replace my Whirlpool RO system, as... I got this to replace my Whirlpool RO system, as it was very similar. Installation was easy and instructions were clear. Quite satisfied. Rated 5 out of 5 by Ray from A plumber is needed to install the unit and once... A plumber is needed to install the unit and once set up , the filtration system works great . I am happy with the filtered water for drinking now . Replacing the 3 filters should be easy every 6 months . Rated 4 out of 5 by Paul from 60 days later it is doing the job. system will... 60 days later it is doing the job. system will 'purge' from one of the filters every other day which seems to be a waste of water. the bad taste of our city water is gone and we are very happy at this point. installation was harder than i expected. Rated 3 out of 5 by Quaze22 from Great taste, but it leaked I had this system for two years or three years when it started leaking. My first thought was that it might have something to do with the filters, so I replaced them...no luck. So then I just repurchased the whole system, since I had just invested in the new filters, and it's not that expensive a system--in fact, a full set of filters and membrane is more than half the value, and they come with it when you buy. I've added a leak detector under the sink for the next time it happens...which I suspect there will be. It depends on your water pressure. If you are on city water, you will most likely not need a water booster. what hook up requirements is there... ? Is it easy to install? What is required? Hook up is pretty straight forward. They provide you with a number of good length coloured tubing which simply use push connectors when connecting to the various items. For under the sink installs, the amount of plastic tubing would certainly suffice for the most common installs. If you're opting for a more remote install location, you'd need to purchase additional tubing. All in all the system installed quite easily...maybe 1 hour max? You bet. It can be installed under the sink or in a more remote location. I opted for under the sink and I have room to spare, even with a nice size tank and this unit. Can I use my own faucet instead of the one provided with the system. If it is a &quot;yes&quot;, please provide the set up diagram. Thank you!.